Camp One Step’s Medical Director Susie Burke leads our volunteer medical team. 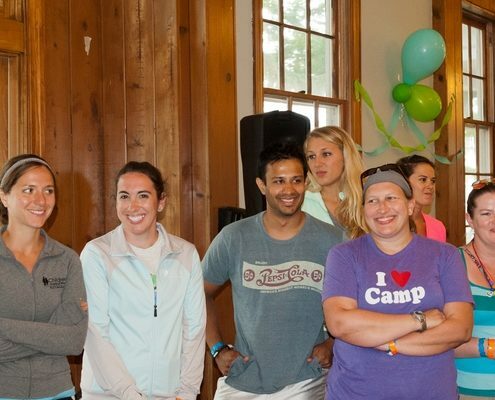 The Camp One Step medical team is comprised of volunteer physicians and nurses who have a passion for working with children and adolescents who are or have experienced the challenges of a life threatening illness. Even though it is important to have staff with pediatric oncology experience, we also welcome staff with other clinical backgrounds such as general pediatrics, adult oncology, emergency, and ICU to name a few. The medical staff work closely together in teams to address the medical needs of each camper. Our goal is to promote the health and well-being of the campers in an atmosphere of fun. Susie Burke is the medical director for Camp One Step and has over 35 years of experience working with children and adolescents with cancer. Her educational background includes a Bachelor of Science degree in nursing from Creighton University in 1981, and a Master’s degree in Nursing from the University of Iowa in 1992. She has been certified as a pediatric Nurse Practitioner since 1990. Currently, Susie is employed by the Medical College of Wisconsin and is working as a Pediatric Nurse Practitioner in Oncology at the Children’s Hospital of Wisconsin in Milwaukee, Wisconsin. Susie’s involvement with Camp One Step started back in 1983 where she participated as a counselor and program leader. Since 2004, Susie has been a key member of our medical team since 2004. Jen Reichek is Camp One Step’s Medical Advisor for Camp One Step. As an attending physician in Oncology at and the director of the STAR Survivorship program at Lurie Children’s Hospital, she has over 10 years of experience working with children and young adults affected by cancer. Jen has a BA from Wesleyan University in Connecticut, a Master’s in Social Work from Smith College, and an MD from MCP-Hahnemann University (now Drexel). She did her pediatric residency and her hematology/oncology fellowship at the Children’s Hospital of Philadelphia. Upon completing training in 2008 Jen moved to Chicago and quickly became involved with Camp One Step first as a medical staff person, and then as the medical director. · Minimum time commitment will vary for each program. For summer camp, we require a commitment of 4 full days at camp. Emergency Medical Technicians and nursing students are encouraged to apply for counselor positions by emailing Dperkins@camponestep.org.